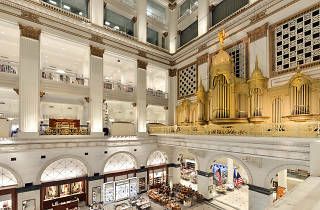 The national retail chain sets up camp in Philadelphia’s historic Wanamaker building. Shoppers will find all the typical department-store goods—clothing for men, women and children, shoes, cosmetics, jewelry, home goods, electronics and more—but architecture lovers will find plenty to love, too. 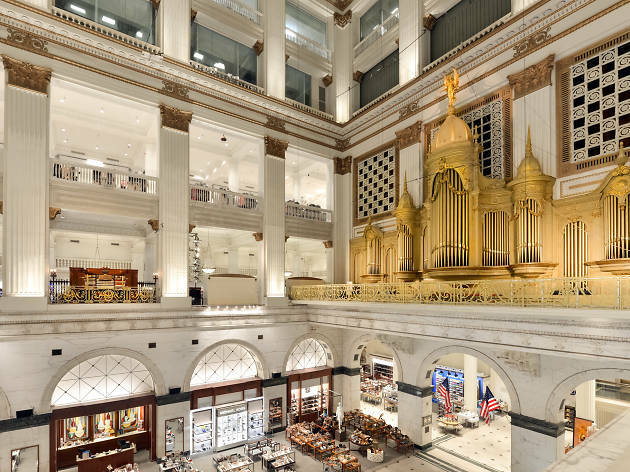 The Wanamaker building has been a hub of Philadelphia retail for more than 100 years—and a registered U.S. National Historic Landmark . Step into the awe-inspiring Grand Hall to marvel the lofty room flanked by gorgeous columns and balconies and to rub the 2,500-pound bronze Wanamaker Eagle that’s still perched toward the north end of the room. The Grand Hall also houses one of the world’s largest organs, the Wanamaker Great Pipe Organ, which you can hear at concerts throughout the year and, perhaps most notably at the Macy’s Christmas Light Show each December.